RAL P1 + P2 Set 300 plastic colour plates in three protective | mode...information s.a.s. For RAL PLASTICS, polypropylen was chosen, which assures diversified applicability. 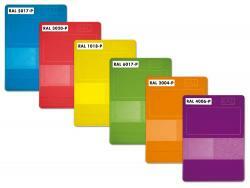 RAL PLASTICS guarantees best possible translation of RAL paint colour shade into an identical shade for plastics. Thus, using RAL PLASTICS, manufacturer and plastics processors can save time, costs and raw material. This material is an ideal partner also for innovative architecture in the 21st century.